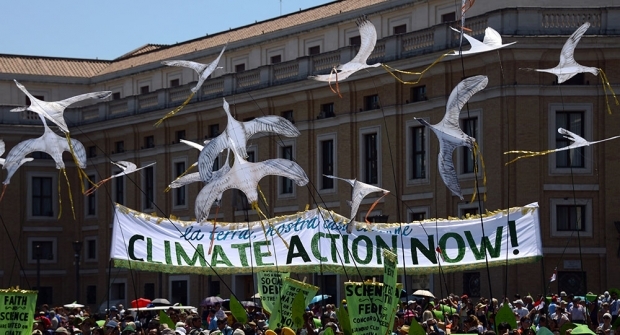 Environmental activists display a call to action banner as they arrive on St. Peter’s square prior to Pope Francis’ Sunday Angelus prayer at the Vatican last month. The activists urged the adoption of an ambitious, legally binding global agreement on climate change at the U.N. conference in Paris this December. By Ramesh Bhushal, a journalist based in Kathmandu. This article was first published by chinadialogue. It is still possible to limit average global temperature rise to two degrees Celsius (2˚C) and avoid catastrophic climate change, but the remaining global carbon budget—the amount of carbon that can be safely released into the atmosphere if this limit is to be met—is rapidly diminishing. This was the verdict of the world’s top scientists who gathered in Paris last week to urge politicians to take bold action to curb carbon emissions ahead of December’s U.N. climate summit in Paris. The scientists warned that to avoid a dangerous global temperature rise, the world needs to limit future carbon dioxide emissions to 900 billion tons, roughly 20 times the emissions in 2014. “Moving beyond two degrees is not an option, so the scientific community is worried about the lack of adequate action by countries, but it is still doable,” said Hervé Le Treut, Director of the Institut Pierre-Simon Laplace. “One-third of the world’s oil reserves, half the gas reserves, and 80% of the coal reserves have to be left in the ground to keep the world below two degrees,” said Thomas Stocker, a Swiss climate scientist and co-chair of the Intergovernmental Panel on Climate Change (IPCC)—the U.N.’s top climate science body. In preparation for the Paris summit, some countries—including top emitters China, the U.S., and the European Union—have submitted their national emissions control plans to the U.N., known as Intended Nationally Determined Contributions (INDC). But scientists warn these plans are “severely insufficient” and could lead to warming of more than 3˚C. “These countries contribute 54 percent of total carbon emissions globally and their current pledges will reduce emissions by about 17-19 percent of the 19 billion ton emissions gap to achieve the climate target,” said Michel den Elzen, Senior Analyst at the Netherlands Environmental Assessment Agency. The 19 billion figure refers to the gap between the emission level needed to keep global average temperature rise within 2˚C and the emission level that is obtained if current INDCs are added up. In what was called the Emissions Gap Report, the United Nations Environment Programme warned in 2010 that a huge gap exists between national commitments and what is needed in actual emissions. Now, the U.S. has pledged to cut its greenhouse gas emissions by 26-28 percent by 2025 compared to 2005 levels. China has promised an emissions peak by 2030 and the European Union has committed to reducing emissions by at least 40 percent below 1990 levels. Still, the gap remains wide. “The science has given the maximum numbers and the technological advancement of solar, wind, and batteries allows us to achieve the target,” said Chris Field, Director of the U.S. Carnegie Institution’s Department of Global Ecology. France is hosting the next U.N. climate conference (COP21) in December this year, where over 190 governments are expected to sign a deal to curb long-term greenhouse gas emissions.